Language, the shape and instrument of our thoughts, is perhaps the most important of the tools that made us human. And like all such tools, it aroused the jealousy of the gods who schemed to keep it from us. Those who break the embargo are, of course, punished severely. Odin, for example, hung from a tree for nine days and nine nights in order to acquire wisdom, and this wisdom came to him in the form of runes, written language. Significantly, M.D. Lachlan reverses this procedure: the witch queen who is Odin's sworn enemy puts herself through extraordinary torments in order to steal runes from her foe, each rune being in its turn a symbol of power. The acquisition of language, of knowledge, of power (the three are pretty much the same thing) is part of an unending continuum of pain, from the suffering of the gods to the suffering of the witches to the suffering of humanity. And, indeed, the witch queen is far from alone, since this whole novel is populated with characters who inflict agonies upon themselves in the belief that only thus will they acquire wisdom. Of course, suffering is as likely to result in insanity as it is in wisdom. There are enough clearly mad figures in this brutal tale for us to question the sanity of others. In which case, the fabulous panoply of gods and witches and werewolves who populate this harsh and unforgiving landscape might as well be the conjurings of lunacy. It all depends on how you see the world. We begin with that most basic of all uses for language: story. Stories that we tell and are told guide the way we view the world, shape the course we take through it. The course we take through the Scandinavian world of Wolfsangel is shaped by a host of stories, stories of the gods and of Ragnarok, stories of witches, stories of heroes toasting each other perpetually in Valhalla, stories of the new religion of Christianity that is just beginning to make itself felt around the edges of the world but that seems inordinately more cruel than the Norse world we know. We are assumed to be familiar with most of these stories; their purpose is not to surprise us (though the perspective taken might sometimes do so) but rather to convince us that against such a background the events we follow make sense. We know something of the violence of Norse mythology, of the berserkers, of the cult of the warrior in the Viking lands. What immediately marks Lachlan as a writer to watch is the skill with which he convinces us that this is not just a story we are being told but the reality of his characters, and if we first accept that this is the actuality within which those characters move, we more readily accept the cruelty endemic to this novel. All of this is laid out in the opening chapter. A longboat, commanded by King Authun with a minimal number of his followers on board, approaches a remote village on an island we assume is near the coast of Britain. Before they finally reach the shore, Authun announces that the men will all die on this raid, which perversely encourages them since their highest ambition is to die in battle. Authun is here to ensure his succession. With no male heir, the queen of the witches has prophesied that he will find a baby boy on the island who can be raised as his son. But when the king bursts into the Christian church above the village he finds not one but two baby boys, twins. Nevertheless he gathers them up and heads back to the ship, pushing off with one faithful retainer while his men are left to fight and die against the local defenders. Of course, no-one must know that the baby boy the king's wife is supposedly due to deliver has actually been acquired this way, so the old retainer must die also. The old man recognizes this and leaps to his death in the middle of the North Sea while waving his sword about as if fighting a sea monster, so as to preserve the story that he died in battle. It's all there: the power of story to direct action; the belief in and duplicity of prophecy; the sense that a hard world demands cruelty of its inhabitants. This is the world we must accept on its own terms if we are to enter the world of Wolfsangel . The action now jumps forward some years to find Authun having retreated from human society, while his son, Vali, in accordance with feudal practice, is living at the court of a rival king. Vali is altogether too modern a character to seem a believable part of this milieu: he has fallen in love with Adisla, a local girl, and favours the idea of being a farmer rather than a warrior. When an enemy raids the village he organizes a defence that achieves an unlikely victory against overwhelming odds, though his tactical thinking goes against the warrior ethos and wins him no friends even among those he defended. But the raid turns out to have been no coincidence: the raiders were trying to capture Vali, and failing in that they kidnapped Adisla. Vali now sets out on a quest to find and rescue Adisla. He is joined on this quest by his brother, Feileg, though neither of them recognize the relationship. Feileg was the witch queen's fee for helping Authun, and he was raised first among warriors then among wolves. He has become feral, as likely to howl like a wolf as talk like a man, but when captured by Vali he ends up trailing along. The quest that occupies a good chunk of the middle of the book is, on the surface, a fairly conventional sequence of capture and escape, challenge and betrayal. But it is what is going on just below the surface that is interesting. We know by now that one of the twins will become the incarnation of Fenrisulfr, the giant wolf that kills Odin at Ragnarok, and it seems at first that in the interplay between wild Feileg and civilized Vali, it is Feileg who is destined for this role. But at the start of the quest Vali puts himself through a simulated drowning (a medieval equivalent of waterboarding that is one of the leitmotifs of this novel) in order to gain insight into where Adisla has been taken. As I pointed out before, with magical insight comes madness, and Vali is clearly deranged by this episode. Consequently, the quest becomes not a journey of discovery but of transformation: Vali becomes wild, blacking out at key moments during which he commits acts of bloodthirsty savagery sufficient to unnerve even berserkers, while Feileg becomes gradually more human, more civilized. 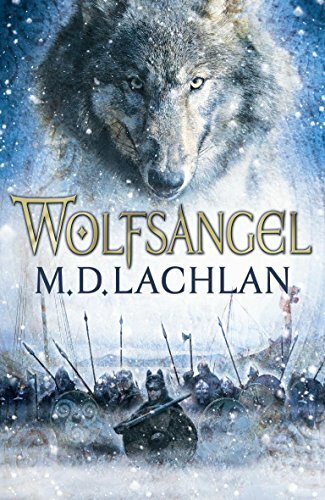 By the time the various parties in this adventure have reached the inhospitable northern isle where Lapp shamen have drawn them, Vali is clearly a werewolf and lost to humanity. I confess by this point I had rather lost track of which magical power was working on behalf of Odin and which against him; which thought they were acting against him while actually furthering his interests and which were attacking him while believing they were acting on his behalf. Such are the confusions of derangement and deception that it is perhaps impossible to keep all of this straight, but to an extent it doesn't matter. The various forces that seem to be pulling the strings, god or witch or shaman or king, are seen to be impotent in the face of the grander, bloodier and simpler drama of Vali's loss of humanity and the cost of being a werewolf. Conventionally, in a werewolf story the wolf is as human a creature as the man: the workings of civilization and reason apply even within the body of the wolf. But in Wolfsangel that doesn't hold, because this is a human civilization that extols the virtues of the wolf, holding savagery in high esteem. Here it is the wildness of the wolf that carries through into the human. Vali's transformation into a wolf is a tragedy precisely because of the loss of reason, because Vali as human was so modern. Events on the shamen's island result in gory violence, which is then replicated in the mountain lair of the witch queen that is the inevitable setting for the novel's final confrontation. Except that it isn't really final, because the quest disguised another transformation: Vali, Feileg and Adisla were turned into archetypes, their story due to be echoed throughout the ages in future volumes. How the brute violence of the wolf will fit into less savage, more rational times is something we can only wait to see. But for now, the wolf as part of the myth of Odin and the werewolf make for a bloodier if more intelligent story than we might have anticipated.